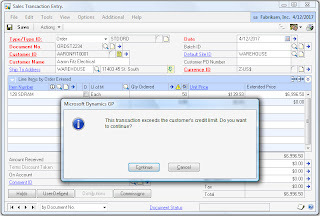 A few days aback, I was asked how to keep the "This transaction exceeds the customer's credit limit" message box from popping up when entering a Sales Order. At first I thought it was a strange request, since the warning serves its purpose, but then the user explained that they had their own credit management system which takes into consideration a lot more information that GP does not manage beyond the aging buckets and the limit itself. In addition, they already had a customization in place to check the customer's credit limit against their credit system and automatically set the order on hold if limit was exceeded. In summary, the message was an inconvenience since it appeared each time a line item was entered. 1) Add the Sales Transaction Entry window to Visual Basic. 2) Open the Visual Basic Editor and locate the SalesTransactionEntry (Window) object. Double-click on it to bring up the editor. I thought this would have to be turned on to a specific User Class ID in Alternate/Modified Forms and Reports but it seems to be available to all. Is there a way to limit this change to one User Class? Not sure what you mean by "pending PO is active". However, have a look at Business Alerts. This should help you with what you are trying to achieve.